Sale Price $2,799.95 Great Financing Available - Free Delivery - (some restrictions may apply) The Husqvarna LS series of lawn mowers have been designed for the informed homeowner. The LS tractors have features like Electric PTO Clutch to keep belts tight at all times and reduces shock and stretching of belts. The pedal operated locking differential for increased traction on slopes, wet grass, or when you absolutely need it.The cruise control for comfort and consistency of cut. Battery indicator with charging port to keep battery ready to go all year long. The tough rugged brush guard to protect the metal hood when life throws you a curve. Most of all the Fabricated deck with welded 1/4 inch steel skirt on trim side that increases durability and the deck wash out port that helps clean all the old grass out. Husqvarna gives you a 3 year warranty on the unit. 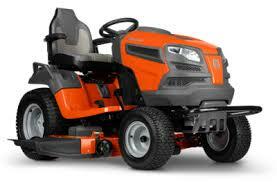 Here at Athens Lawn & Garden LLC we sell only the best equipment like the Husqvarna power equipment line. We take pride in our mechanics ability to deliver the best service, or sales staff to be the most helpful, and making the experience one of the best you've had. Athens Lawn & Garden has been a leader in sales and service of Husqvarna equipment for over 32 years. Call or come by today and let us help you pick out the right piece of equipment for your lawn care needs.